It started with a cigar store label. me smiling. I hope you enjoy them too. 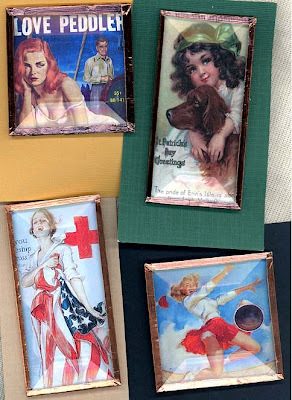 The Love Peddler is from a dime novel cover, the Irish lass and Red Cross worker are from Victorian postcards, and our cheerleader is from a pinup calendar. The great Eartha Kitt, the definitive catwoman and a pinup couple...fun at the beach! Pinup gals from calendars and of course, the fabulous Josphine Baker. 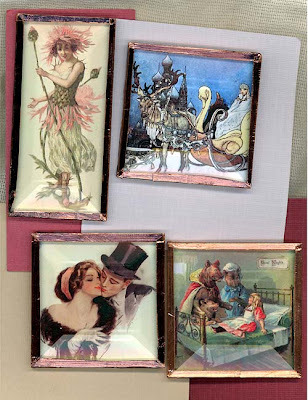 Fairy tale and storybook illustrations and an Edwardian post card. 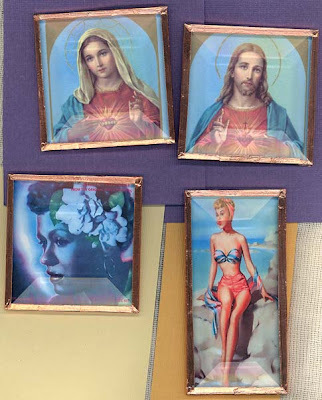 Sacred Heart icons, pinup gal and the great Billy Holliday. Images that make me smile. 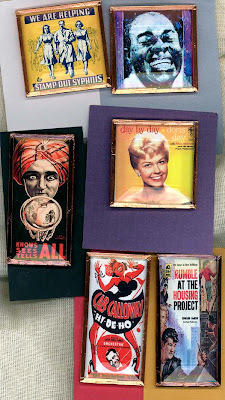 Nothing like Doris Day looking back at you, love the wild eyed swami and my personal favorite, the government issue WW2 stamp out syphilis poster! 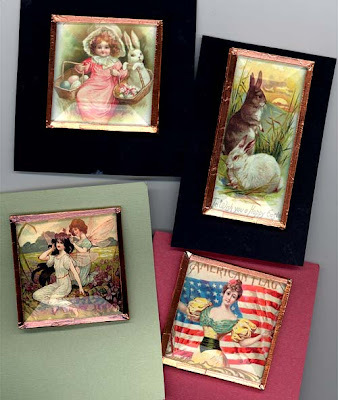 and last by not least, more Victorian post card images. to the vagrant gypsy life, To the gull's way and the whale's way where the wind's like a whetted knife; And all I ask is a merry yearn from a laughing fellow-rover, and quiet sleep and a sweet dream when the long trick's over." I love these words by John Masefield, a man who trained for the sea life in order to break his "addiction to reading." His time aboard a ship only fueled his reading time and from this he decided to become a writer, a story-teller. I smile as a I write this because as bloggers we have all become storytellers, who knew? My earliest memories are of water. My mother and father spent summers at Jones Beach and Cape Hatteras in the 1940-50s and when their eldest daughter was born, it was only natural that she be carried to the sea along with the picnic hamper. I remember sitting in the sand and digging holes to China, building sandcastles and decorating them with the seaweed that the tides would bring in. I would carry home sand in my shoes and pockets full of shells and sea glass. The sea shells I still have today, along with rocks and minerals and crystals and fossils and other bounty from nature, but that is for another blog. I have a photo of me all of 9 months old, sitting in the sand wearing a sun bonnet at Jones Beach...funny little black and white photo that I cannot put my hands on. Once I find it, I will upload and add to this posting. It was 1957 and the "burbs" were calling so my folks left the city and moved to Lincoln Park, New Jersey. Dad got tired of the long, hot bumper to bumper drive to Jones Beach and decided to install an in-ground pool in our backyard. Big stuff in 1960, it was a tiny little thing (10 feet by 20 feet) but we loved it and lived in it all summer long. 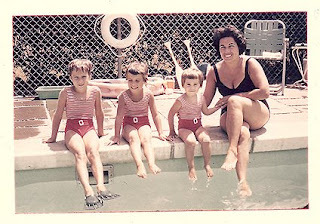 This family shot of the women around the pool, from left to right - "me" (eight years old and in fins--natch), my sister Barbara age 6 and my baby sister Renee, age 2 and our beautiful mother. 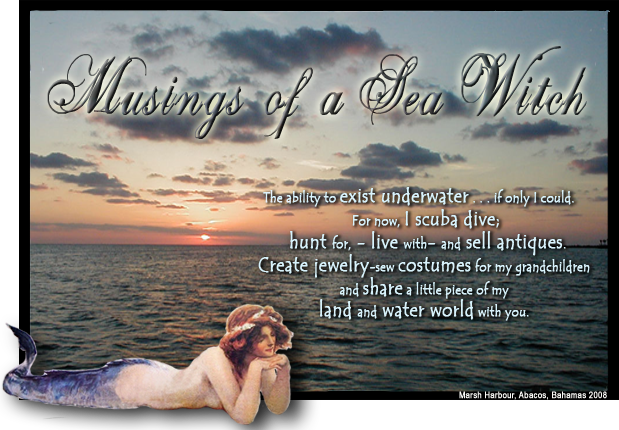 As a child, I discovered that a towel, tightly wrapped around my legs would not make me a mermaid, so I would have to seek other alternatives to becoming waterbound. 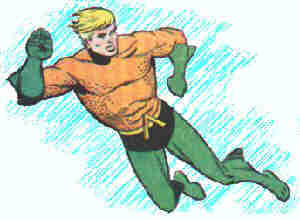 In the late 1950s and early 1960s, the only two people who met that criteria were Aquaman and Mike N elson (Lloyd Bridges) of Sea Hunt. I devoured Aquaman comics and sat glued to the black and white Magnovox watching Mike Nelson save the day. 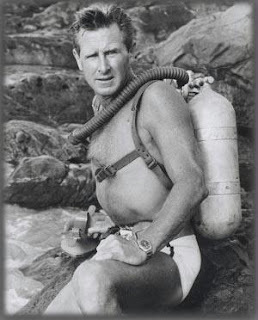 At the conclusion of each episode, Mr. Bridges always made a public service announcement to the viewers to treat the sea kindly. A steward of the water world, he was handsome and had a tank on his back with a mouthpiece that fed you air...you became a waterbreather. Even then I knew that I must have this amazing apparatus that will let you breathe underwater. 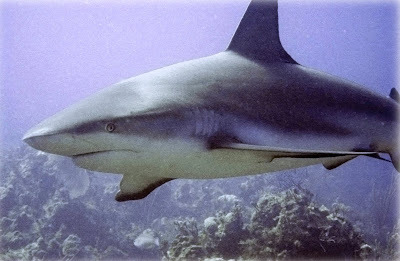 Fast forward many years and I am a 54 year old woman with a dive certification, scuba gear, and a man who is a Padi instructor. I found my Aquaman and we both travel the Keys and the Caribbean in search of water worlds. It's me...a siren of the sea! 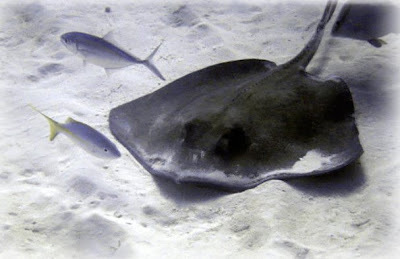 The beauty of a Grand Bahama Island reef. 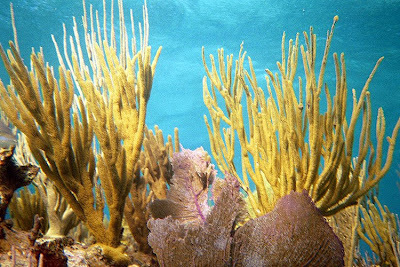 These are the natural colors of these corals set against brilliant turquoise blue waters. (my dad's old point and shoot underwater film camera. 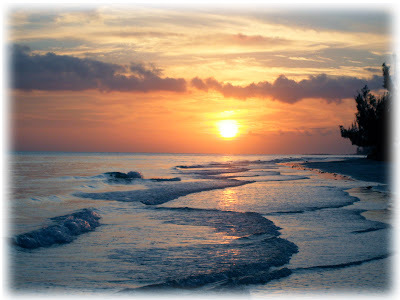 Port Lucaya beach at sunset. a perfect end to a day in the water. And so I go down to the sea whenever I can for it sustains me. These bloggers, that I have come to know through "one vintage hag," show their heart, open and honest, unafraid to share their joys; their families, their friends and their pets; their interests in vintage things, antiques and how they live with them; and their eyes and how they see all of these things around them. Oh those eyes, how I love visiting and seeing what you have created from found objects, bits of vintage laces and jewelry, stones, shells and other found treasures picked up along their travels and repurposed into lovely or quirky or amusing or flat out weird with a joy of their own. So I begin my own blog this evening with this dedication to three incredible women that I am truly grateful for. First, my mom, who watches me from heaven and is laughing as she elbows my dad in the ribs and says, "Look Paul, your eldest daughter is now blogging." My mom, who I first introduced to the Internet in the early 90's, and who saw, even then, the endless possibilities of the world's information at her beautiful fingertips. If she were here with me today, she would be blogging. I love you mom and not a day goes by that I do not think of you. Kiss dad for me too. Second, "one vintage hag" who asked me a few months ago how to build a blog. I knew when she shared those words with me her blog would be wonderful...what I did not count on was her drawing me into all of these amazing places in blog land. I have followed each and every blog posting she has made and from there entered into a world of new friends, artists, personalities, and all of their pets. But more than that, through her blog she has willingly shared her vulnerability as well as her creativity, generosity, and her heart. I thought I knew her pretty well, but her blog shared more of her soul with her writings. What a gift she shares. Finally, to a friend in Flagstaff and writer of children's books, a woman who loves to hike the beauty of Arizona, a journalist who advocates the craft and my friend, Linda Kranz. I can use her name because she is a published author and well known in the journaling industry. Linda, you would be proud to know that I am blogging, my form of journaling and so I also dedicate my first blog to you. Three phenomenal women, my mom, one vintage hag and a writer. How blessed I truly am. So I blog. I hope you will visit from time to time.